CLINTON HILL — Community board members objected to naming a corner for the late rapper Biggie Smalls because, according to some, he was a criminal, a misogynist — and too fat to be honored. CB2 committee member Lucy Koteen said she "looked up the rapper's history" and read what she had learned to the full board Tuesday night. "He started selling drugs at 12, he was a school dropout at 17, he was arrested for drugs and weapons charge, he was arrested for parole violations, he was arrested in North Carolina for crack cocaine, in 1996 he was again arrested for assault, he had a violent death and physically the man is not exactly a role model for youth," she said. "I don't see how this guy was a role model and frankly it offends me." Kenn Lowy, board member and owner of the Brooklyn Heights Cinema, said he did not appreciate that the rapper, whose birth name was Christopher Wallace, referred to women with derogatory names in his music. But the real stumbling block to the effort to co-name the corner of St. James Place and Fulton Street "Christopher Wallace Way" is that Letitia James — a councilwoman and candidate for public advocate — has yet to issue a letter of support, which is necessary for the proposal to go forward. So it was "another day, another struggle" for LeRoy McCarthy, 45, who began the movement to name the intersection for Notorious B.I.G. McCarthy said after the meeting that "board members should not hold Wallace's physical appearance nor how he died against him." "There are many artists that share stories in a vernacular that their audiences understand," said McCarthy in response to the complaint about misogynistic lyrics. 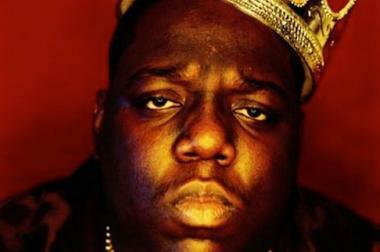 "Biggie used the language from the streets he grew up in to convey what he wanted to say." Wallace was raised by a single mother at 226 St. James Place in Clinton Hill. He went on to become an award-winning rapper and Brooklyn icon. He was killed in a drive-by shooting in Los Angeles in 1997. McCarthy presented the board with letters of support from two local churches, a mosque, a nearby block association, several local businesses and more than 1,000 comments from people all over the world who signed an online petition in support of the co-naming. The issue was tabled Tuesday by the board's Transportation and Public Safety Committee until James or her successor issues the letter of support. James did not immediately respond to a request for comment. James' likely successor, Laurie Cumbo, who is running unopposed for the 35th District City Council seat, did not immediately respond to a request for comment.